Application time limit: Within 6 months from the day the employer or his or her legal representative signs for the ‘employment authorization’ written instructions (aka ‘import written instructions’) at the Labour Affairs Bureau or the effective date of the written instructions. Copy of the joint statement of labour cooperation (employers of domestic helpers only). The applicant may inquire about the result through the “Inquiry System of Progress of Application for “Authorization to Stay for Non-resident Workers” in the Preliminary and Initial Examination Phases (applicable to non-skilled workers and domestic helpers from Mainland China)”, or by presenting the “receipt of application” in person (or through the employer or employment agency) to the Subdivision around 5 working days after the above documents are properly submitted. If the application is approved, the applicant is required to collect from the Subdivision the preliminarily approved “application form” and the relevant copies, with which he/she can apply to the border control department in the Mainland for a “P.R.C. Permit for Travelling to and from Hong Kong and Macao” (hereafter call “Two-way Exit Permit” for short) and an endorsement for the “non-resident worker”. Then the applicant may proceed to the formal examination procedures. Copy of other certificates or documents (specifically named in the “employment authorization” written instruction). Upon completion of the procedure, the Subdivision will issue a “Revenue Receipt” and grant “Authorization to Stay for Non-resident Workers” (which expires on the same date as that of the “Non-resident Worker’s Identification Card”, hereafter called “Non-resident Worker’s Card” for short). On the date of collection specified on the Revenue Receipt, the “non-resident worker” should bring the Receipt to the Subdivision concerned or Zone K, 1/F, Centro de Serviços da RAEM in person, to collect the ‘Non-resident Worker’s Identification Card’. He or she may also authorize a third person (Remark 4.) to collect the Card on his or her behalf. To learn about the readiness of the Card, the non-resident worker may refer to the “Inquiry System of the Date of Collection of the ‘Non-resident Worker’s Identification Card’” or call (853) 2872 5488. Subdivision concerned will conduct preliminary examination of application after necessary documents are submitted. The applicant may inquire about the result through the “Inquiry System of Progress of Application for “Authorization to Stay for Non-resident Workers” in the Preliminary and Initial Examination Phases (applicable to non-skilled workers and domestic helpers from Mainland China)”, or by presenting the “receipt of application” in person to the Subdivision around 5 working days after the above documents are properly submitted. If the application is approved, the applicant is required to collect from the Subdivision the initially approved “application form”. Initial Examination of the application is instantaneously conducted. If the application is approved, the initially approved “application form” will be returned instantaneously. After entering Macao, the “non-resident worker” may apply to the Subdivision for “Temporary Authorization to Stay for Non-resident Workers” in person (or through the employer or employment agency) with the “application form” and a valid identification document. Then the “non-resident worker” can remain and temporarily work in Macao legally until the Authorization expires. A completed “Declaration of Identification”. Upon completion of the procedure, the Subdivision will issue a “Revenue Receipt” and grant “Authorization to Stay for Non-resident Workers” (which expires on the same date as that of the “Non-resident Worker’s Identification Card”). After the “Non-resident’s Working Permit” has been approved, the “non-resident worker” can bring along the original of the valid identification document, which is used to apply the Working Permit and the revenue receipt and come in person to the designated locations within office hours to Register for Automated Passenger Clearance System (e-Channel). [For details, please refer to “Registration for Automated Passenger Clearance System (e-Channel) for Non-residents”]. On the date of collection specified on the Revenue Receipt, the non-resident worker should bring the Receipt to the Subdivision concerned or Zone K, 1/F, Centro de Serviços da RAEM in person, to collect the ‘Non-resident Worker’s Identification Card’. He or she may also authorize a third person (Remark 4.) to collect the Card on his or her behalf. To learn about the readiness of the Card, the non-resident worker may refer to the “Inquiry System of the Date of Collection of the ‘Non-resident Worker’s Identification Card’” or call (853) 2872 5488. After the above documents are properly submitted, the Subdivision conducts an initial examination of the application instantaneously. If it is approved, the initially approved “application form” will be returned instantaneously. 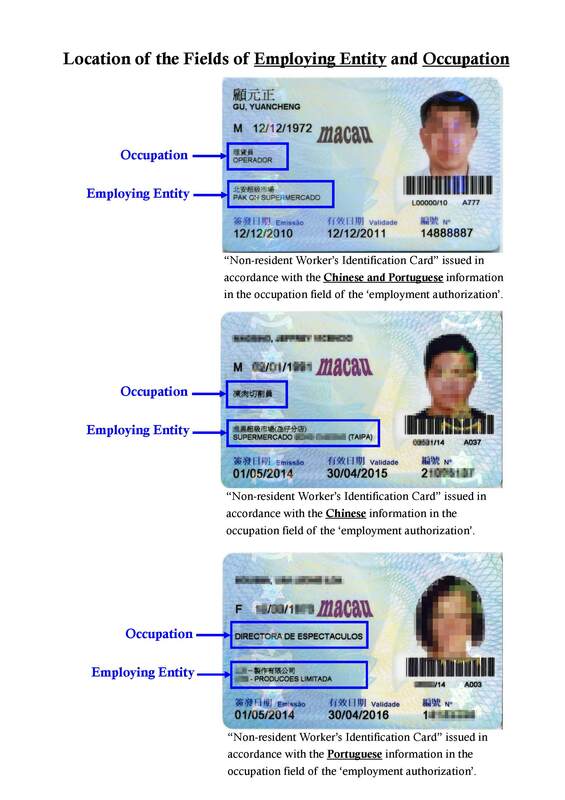 After entering Macao, the “self-employed” listed in the above initially approved “application form” may apply to the Subdivision for “Temporary Authorization to Stay for Non-resident Workers” (valid for a maximum of 45 days) with the “application form” and a valid identification document. Then the “self-employed” can remain and temporarily work in Macao legally until the Authorization expires. On the date of collection specified on the Revenue Receipt, the “self-employed” should bring the Receipt to the Subdivision concerned or Zone K, 1/F, Centro de Serviços da RAEM in person, to collect the ‘Non-resident Worker’s Identification Card’. He or she may also authorize a third person (the employer / the employment agency authorized by the employer / a legal representative) to collect the Card on his or her behalf. To learn about the readiness of the Card, the non-resident worker may refer to the “Inquiry System of the Date of Collection of the ‘Non-resident Worker’s Identification Card’” or call (853) 2872 5488. For details, please see the Labour Affairs Bureau’s website at http://www.dsal.gov.mo/. The legal representative should submit a certified letter of authorization and a copy of his/her valid identification document (the original should be exhibited for authentication. For non-skilled workers and domestic helpers: The applicant may inquire about the result through the “Inquiry System of Progress of Application for “Authorization to Stay for Non-resident Workers” in the Preliminary and Initial Examination Phases (applicable to non-skilled workers and domestic helpers from Mainland China)”, or by presenting the “receipt of application” in person to the Subdivision around 5 working days after the above documents are properly submitted. If the application is approved, the applicant is required to collect from the Subdivision the initially approved “application form”. For skilled workers: Initial Examination of the application is instantaneously conducted. If the application is approved, the initially approved “application form” will be returned instantaneously. After entering Macao, the “non-resident worker” may apply to the Subdivision for “Temporary Authorization to Stay for Non-resident Workers” in person (or through the employer or employment agency) with the “application form”, valid “Two-way Exit Permit” and “Type (D) Stay Endorsement”. Then the “non-resident worker” can remain and temporarily work in Macao legally until the Authorization expires. the employer / the employment agency authorized by the employer / a legal representative. Employers of domestic helpers only; the employer’s signature on the copy of his/her identification document is required if he/she is also a “non-resident worker” or a “Special Stay Permit” holder, and submit the copy of his/her “Special Stay Permit” or “Non-resident Worker’s Identification Card”. Date of Expiry: Correspondent with the limit approved by the Secretary for Economy and Finance or the Director of the Labour Affairs Bureau in the Employment or Work Authorization, unless a shorter term has to be granted according to the stipulation in the system of entry, stay and residence authorization of the Macao Special Administrative Region. Therefore, if an employer (or employee) requests both Chinese and Portuguese languages or the other official language (e.g. request for Portuguese while the ‘employment authorization’ is in Chinese) to be printed in the fields of employing entity and occupation on the “Non-resident Worker’s Card” while the Labour Affairs Bureau’s ‘employment authorization’ shows the information in only one language (Chinese or Portuguese), the employer should make the request to the Labour Affairs Bureau first and have the ‘employment authorization’ updated before we proceed accordingly. Collect by a legal representative.